DECLAN DEVINE admits his promising Derry City side still has some way to go and must err on the side of caution as they prepare for a trip to one of the most difficult venues in the country this Friday night. Devine has already put City's impressive 3-2 victory over Waterford behind him as he looks to mastermind a rare win at Turner's Cross where last year's league runners-up Cork City await. And while expectations levels have risen at the Brandywell club since Devine and his all-Derry managerial team took charge in November, the City boss warned his team are still a 'work in progress' and he expects there to be plenty of bumps in the road this season. 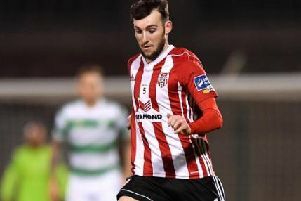 An opening day victory over UCD at Brandywell was quickly followed by a 2-0 defeat to Shamrock Rovers in Tallaght. A quick turnaround saw Derry get back to winning ways in some style against Waterford at home on Monday night but they face a tough ask when they go to meet Cork who themselves got back on the winning trail at Sligo Rovers. Derry's record at Turners' Cross is far from impressive but Devine recalls a rare 1-0 victory when he was in charge in March 2013 as Rory Patterson scored the winner, securing the Candy Stripes' first league win in Cork for 15 years. Before that it was Eamon Zayed who netted the only goal of the game against Cork at the Curragh Road venue as Stephen Kenny, with Devine as his assistant, guided Derry to a 10th League Cup title in September 2011. Derry City boss, Declan Devine was delighted with his side's performance against Waterford. So perhaps Devine is the man to turnaround Derry's dismal form at the Cross. "We haven't won there in a long time," said the City supremo. "I won there five or six years ago in 2013 when Rory Patterson got a last minute winner," he recalled. "I can't remember winning there before that apart from the League Cup Final. "So we've had two wins down there in my time at the club which was nearly 12 or 14 years. We won a League Cup Final and a league game. Cork is the most difficult venue. There, Dundalk and Shamrock Rovers are the three most difficult venues in this country to get a result from. But we'll go down there and have a go. We always knew the first three or four games were going to be extremely difficult." Devine is looking forward to the test and believes the trip to Cork will be a good bonding experience for his newly assembled group. "What I think is good about this week is we get to spend another couple of days together. We travel and live together for 48 hours and it's something we'll embrace and enjoy the journey down and hopefully we can put in a performance which will allow us to enjoy the journey back." Following a hugely impressive win over Waterford at a packed Brandywell on Monday night, Devine was full of praise for his players but he isn't about to get carried away. "Darren Cole set the tone," he said. "He won three tackles in a five second period at the start of the second half. We play on the front foot. Michael McCrudden's movement, David Parkhouse's running. Junior's one v. one play in the first half set the tone and got the crowd on the edge of their seat. Greg Sloggett was excellent too with and without the ball. "Ciaron Harkin is only going to get better. He's going to be an unbelievable player for this club but don't underestimate the huge impact Barry McNamee makes to this team. Eoin Toal at 20 years of age won every header and Ally Gilchrist did brilliantly - I think he is a wonderful defender. I'm delighted with every one of them. "However, we're very much a work in progress and need to take the highs with the lows but I think we'll get better. "I think in Tallaght we weren't as bad as people think and Rovers weren't as good as what people think. The two goals we gave away came from two mistakes but ultimately we didn't pass the ball. That's what we emphasised tonight. We're only a good side when we pass the ball and play at a high intensity. "In Tallaght we gave the ball away too many times. It didn't stick up front and we didn't have enough creativity. But Tallaght is gone. This (Waterford win) is gone tomorrow morning. The next day it's over and done with and we go again for Cork."